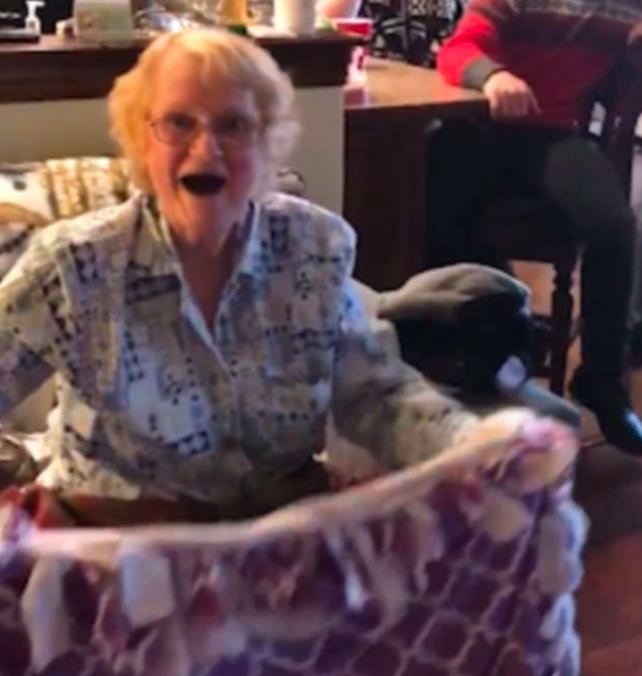 A grandmother going through stage four cancer was left in tears of joy when she received her special 'chemotherapy blanket' containing her late husband's shirt sewn in. The gift was made for Frances Jones by her granddaughter Maddie Smith, and was designed to make sure the 79-year-old was never alone during her treatment. Frances and her husband were married for 56 years before he passed away suddenly from heart failure four years ago. Maddie decided to make the special blanket to bring Frances some comfort during difficult times. With the help of her aunt, Maddie grabbed one of her grandfather's favourite shirts from Frances' house, before sewing it onto a homemade blanket. The heartbreaking video sees Frances opening the blanket, before laughing and then crying while clutching it to her face. From behind the camera, Maddie says: "I think when my grandfather died, he took a huge part of her [Frances] with her too. She hasn't been the same since his death, but with time I've started to see the old her come back little by little. "They did everything together - you've never seen two people love each other more. This is why I wanted to incorporate my grandfather into the gift somehow."